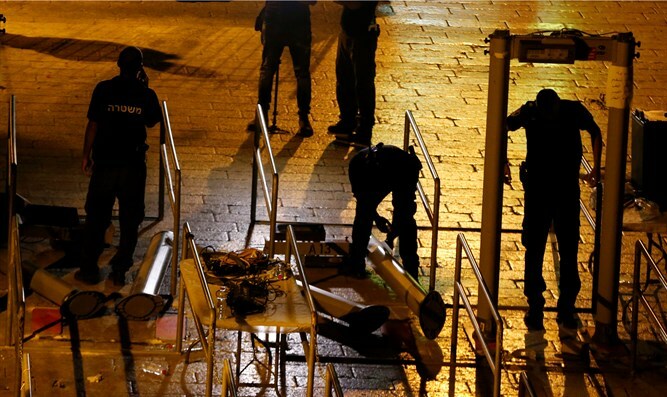 The Supreme Court ordered Prime Minister Binyamin Netanyahu and the Cabinet ministers to respond to a petition by the 'Otzma Yehudit' organization and explain why the magnetometers should not be removed from the gate Jews pass through to ascend to the Temple Mount. Right-wing activists Dr. Michael Ben-Ari, Baruch Marzel, Itamar Ben-Gvir and Benzi Gopstein, petitioned the Supreme Court and argued that the Cabinet's policy, according to which only Jews must pass through metal detectors when they visit the Temple Mount, is discriminatory and unconstitutional. In their petition, the petitioners argue that the State cannot discriminate based on race or religion, and that when it was decided to remove the metal detectors from the gates from which Arabs enter the Temple Mount, the State had no authority to keep the metal detectors only at the entrance the Jewish visitors must use. The petitioners further added that "the Israeli government has given veto power to violent mobs to determine the Cabinet's policy, but since this is a political decision and the court is not inclined to intervene in these decisions. In [submitting this petition], all the petitioners seek is to compare the situations of Jews and Arabs, so that a situation will not be created in which Jews are discriminated against."